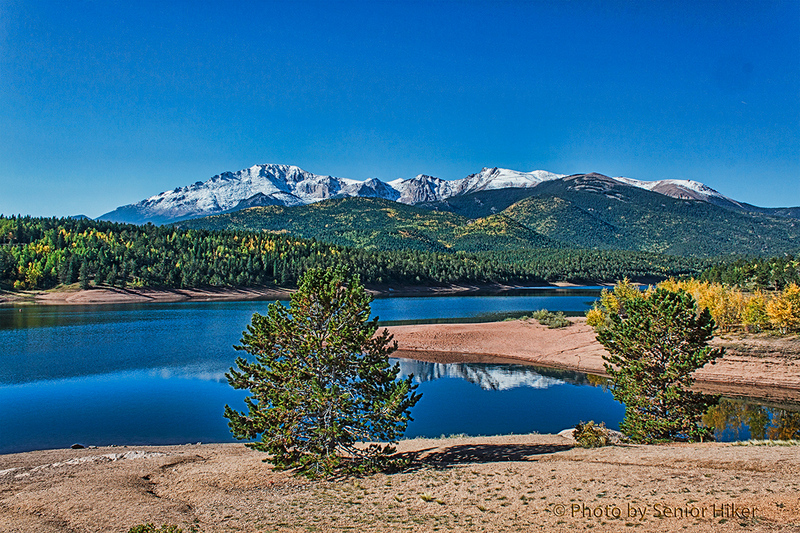 Crystal Creek Reservoir on Pikes Peak Highway, Colorado. September 14, 2012. When Betsy and I took our western trip in 2012, the first place we visited in Colorado was Pikes Peak. We had long talked about visiting the summit of the mountain, and we were delighted that we could see Pikes Peak from our motel on our first night. The next morning we headed to the mountain and up the Pikes Peak Highway. Although the summit was our goal, we had to make several stops on the way up. One of our first stops was at Crystal Creek Reservoir, at about Mile Marker 6. The combination of a beautiful sky, snow-capped peaks and mirror-like water simply made it impossible for us to drive by without stopping. 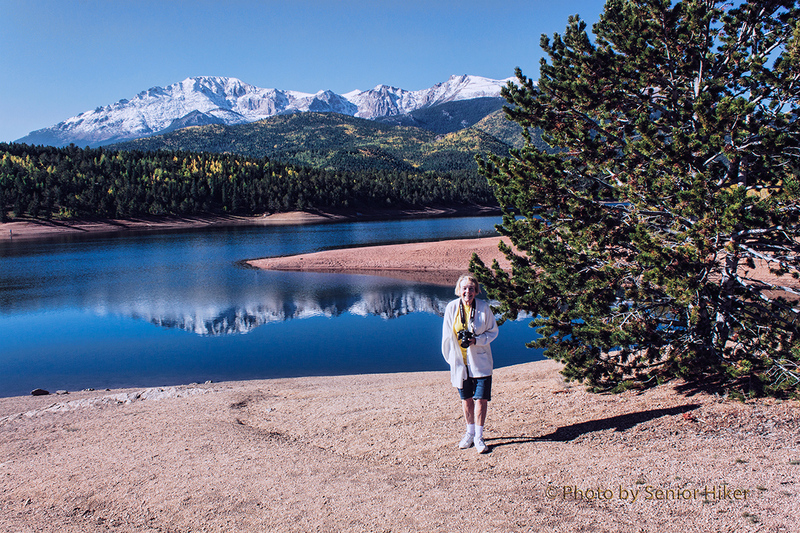 Betsy at Crystal Creek Reservoir, Pikes Peak, Colorado. September 14, 2012. We walked along the shore just soaking up the scenery around us. My snow-loving Beautiful Bride was absolutely delighted. Aspen at Crystal Creek Reservoir, Pikes Peak, Colorado. September 14, 2012. 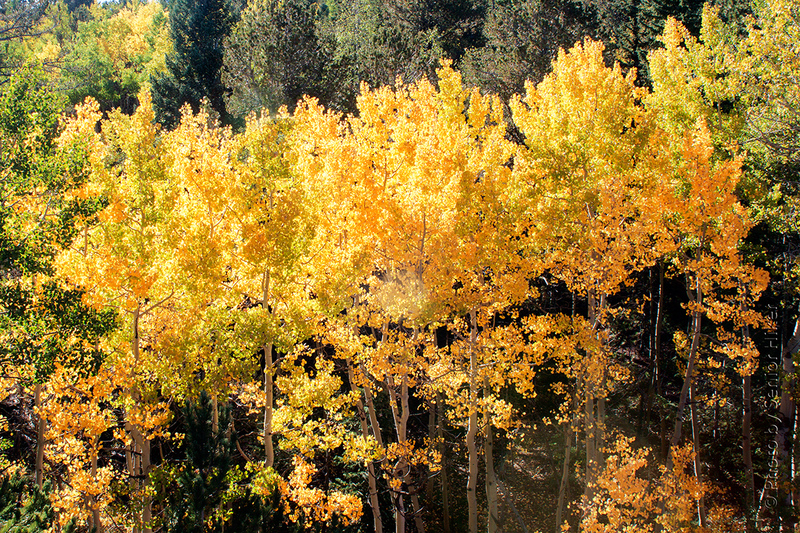 We also enjoyed the sight of some golden aspens, a sight we don’t see here in Tennessee. I couldn’t resist creating a panorama of the gorgeous scene before us. 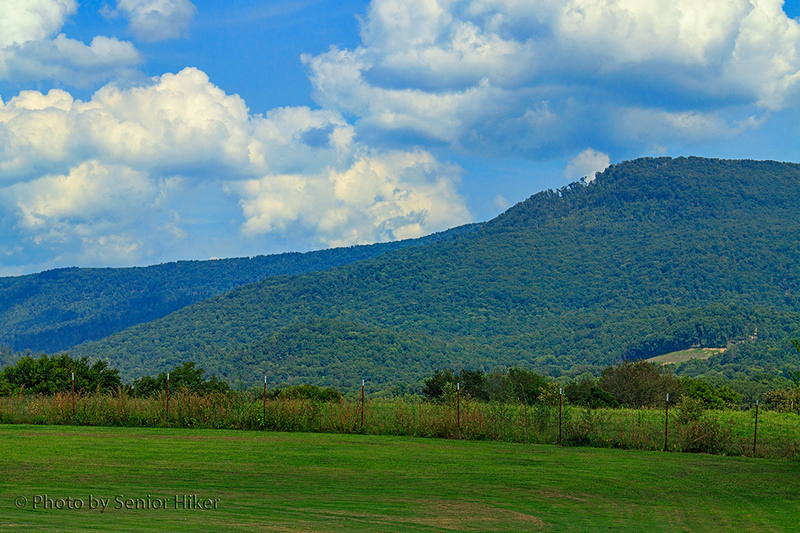 The Sequatchie Valley, Dunlap, Tennessee. August 16, 2014. The Sequatchie Valley in Tennessee is a narrow, straight valley between the Cumberland Plateau and the Walden Ridge. Betsy and I often drive through or across the Sequatchie Valley when we travel south from our home on the Cumberland Plateau. In August Betsy and I met a blogger friend, Lynda, and her husband for lunch in Dunlap, Tennessee, which is in the heart of the Sequatchie Valley. Not only did we have a great time and delicious meal with a wonderful couple, we were also able to enjoy the beauty of the valley around us. We were in the valley on a bright, sunny day with clouds that rivaled the valley in beauty. 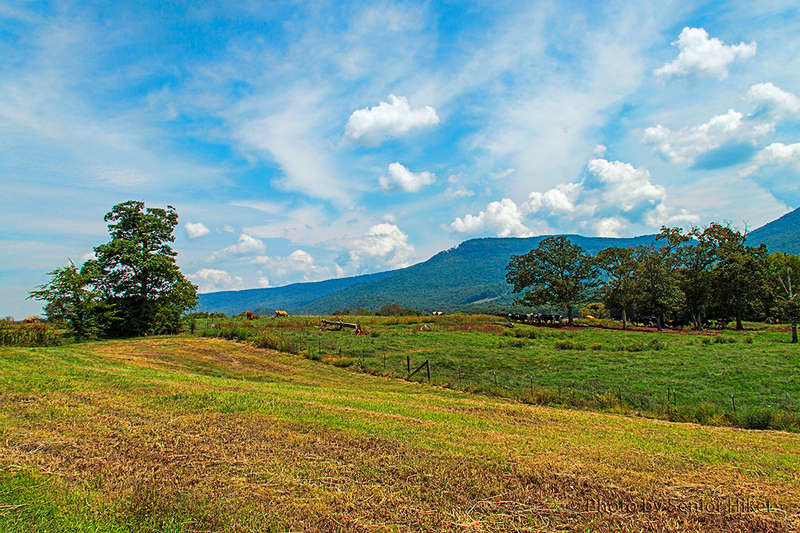 The Sequatchie Valley is primarily rural, dotted with farms and small towns. 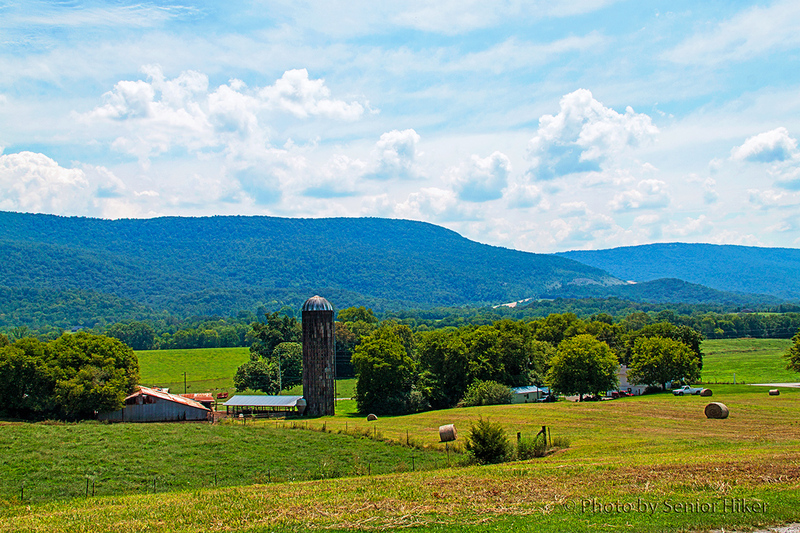 The escarpments of the Cumberland Plateau and Walden Ridge form a picturesque background for the barns and cattle. All in all we had a perfect day in Tennessee’s Sequatchie Valley.